By Matt on June 30, 2018 in Bargain or Just Cheap? The CRKT Minimalist is based on the original, custom Alan Folts designed Minimalist. This popular compact fixed blade can be found for less than $30 and it is extremely easy to carry… but is it a Bargain or Just Cheap? I’ll spill the beans right up front. The Minimalist is a Bargain, not just cheap. It doesn’t have the latest super steel. It doesn’t have the cache of a custom knife. But still, it’s a great knife in part because its small and well designed. The Minimalist is small – truly small – which makes it very easy to carry. 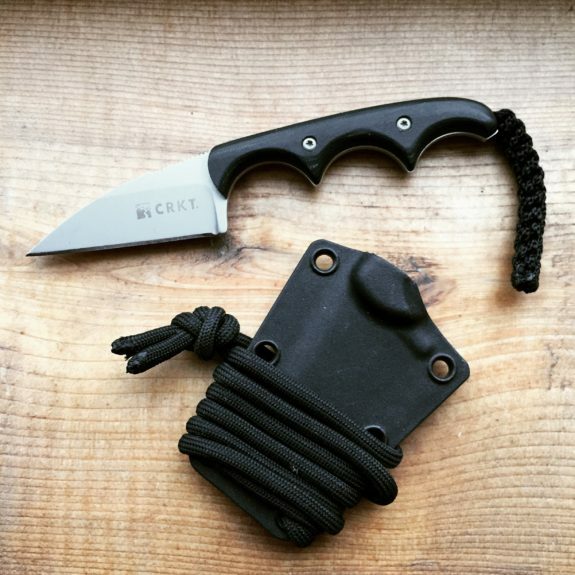 Whether you carry it on your belt, as a neck knife, or in your pocket, the Minimalist is small enough to forget it’s there. It can be carried on your belt as a compact self-defense knife or even attached to something like a Raven Concealment Pocket Shield. Everybody hates knife handles with finger grooves… until they try a CRKT Minimalist. In most cases, finger grooves are an annoyance but in the case of the Minimalist, they are the key to how a knife with such a small handle manages to lock into the user’s hand. That is really the genius of this Alan Folts design. The Minimalist is ground from .10″ thick steel stock and has a relatively high hollow grind, especially on the wharncliffe style blade that I prefer. It is an extremely aggressive cutter thanks to this thin stock and good geometry. The sheath is injection molded but it would pass for real heat molded kydex at a glance. It is actually a decent sheath that retains the knife well and allows a full grip on the knife handle. Like I said, it’s a bargain. The Minimalist is a great little knife if you want a small utility blade to EDC. It’s an affordable, compact defensive fixed blade. It’s just a great knife all around. I put a Fomi Clip on the sheath and wear mine IWB when swimming or on the beach. Works great, swam at least 20 days in the Pacific Ocean and it’s only slightly tarnished from the salt. Great for slicing up fruit, gutting fish, and I suppose in a self-defense situation it would come in handy. Greg, do you prefer it over the TDI knife?